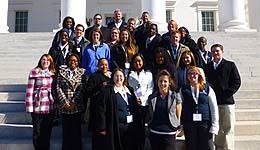 Chesapeake students on the Capitol steps. Getting a closer look at government in action, students from Tidewater Community College’s Chesapeake Campus traveled to Richmond to visit with state legislators and tour the Capitol. “I’ve lived in Virginia all of my life, but this is my first time here. It was interesting to see history and be part of the process, even for a day,” said Lynnail Choudhry, who is studying human services management. The first stop for students was the Library of Virginia, where they listened to Jeffrey Kraus, assistant vice chancellor for public relations for the Virginia Community College System. A tour of the library gallery followed, with a mini-history lesson provided by Adrienne Robertson, a library staffer. The Capitol tour included interior spaces and outdoor monuments. Jim Hines of TCC’s Office of Information Systems served as tour guide and enlightened the group with historical tidbits at every stop.